RULE BRITANNIA, BRITANNIA RULES THE WAVES BRITONS NEVER NEVER NEVER SHALL BE SLAVES? Millennium 2 (or more precisely the period 1000-2008)was a strange one. 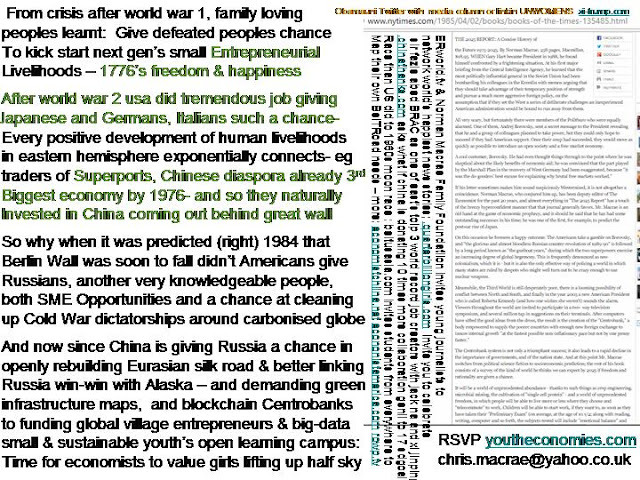 questions on norman macrae's last articles, xmas 2008, welcome chris.macrae@yahoo.co.uk -in fact remembrance parties started 2010 continue to this day round his extreme concern that subprime could distract from the decade that need to value changing education with a plurality of cultural curiosity not hitherto mediated. With so many advances in human knowledge but not necessarily progress in lasting peace and goodwill to all. Lets explore a few timezones of millennium 2. Please note even in 2018 there is as yet no common agreement on how to measure the intangibles valuation of human relationship networks (or how to map local to global value chains in way that all costs and risks are transparent to those who will suffer most on the ground whenever professional subprime). The one thing we should urgently be able to see if we look outside : global connectivity's rapid acceleration now reveals worldwide consequences (eg climate) which play out irreversibly within a generation or two, instead of several centuries. Between 1748 and 1776, Scot Adam Smith lost the battle to return freedom to the way Britain was the first nation to be pivotal to the way that world trade was to be designed for nearly two and half centuries of Industrial Revolution. Adam's second book discussed a second loop to some extent conflicting with his community rising book- to what extent did a nation's size give it an advantage. Adam knew full well that Scotland had failed as a nation. It had been too small to lose half of its peoples savings in one overseas venture that most of them didnt know had been commissioned until it failed. The result the hostile takeover of Scotland by England (euphemism the United Kingdom). In fact London designed taxation policies so that by 1850 over half of scots could not sustain a livelihood in Scotland. Scots emigrated becoming a majority diaspora nation. However Adam's main argument in his book was that although england's first move advantage with steam engines had added to its power to colonise it would be best to anticipate that America would become a larger market. Instead of dictating trade in the empire's interest why not negotiate free trade and freedom of America. As history shows, the Brits failed to do this. Henec the declaration of independence as USA fought to free itself of British control and declared every american's right to be a free and happy entrepreneur. Colonialism, the control of world trade, seems to have emerged as an accident from 1500 as Europeans discovered they were not landlocked- ie there was a new continent to the west which became known as america, and that the far east east including india and china could be reached by sailing round Africa. 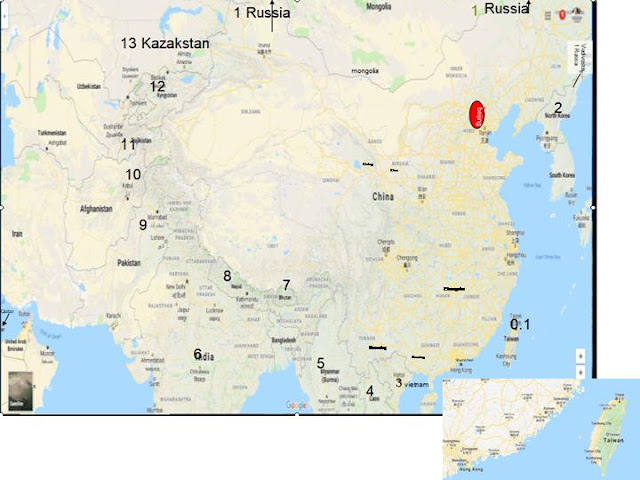 Before this discovery, the main world trade market was the silk road which reached out overland connecting Europe Asia all the way to China. Marco Polo was one of the must famous reporters of this chain of local markets. Taes facilitated win-wins across cultures and exchanges as they took up to 7 years to complete a journey from Europe to China. Most of the wealth and civilisation of the world of the first half of the second millennium depended on being linked in to this world trade route. And the end destinations such as venice in europe (surrounded with its own sub-trading routes across the med sea) and typically Hangzhou in China offered evidence of how win-win market trades developed places. As ships and navies from 1500 started replacing the overland silk road, they tended to arm themselves so that when they reached ports they could dictate trades. Remember too that unless you were a captain, sailing round the world wasnt a popular job, violence was needed to pressgang sailors. And this pattern spiralled it became colonisation - essnetially where an empire country controlled trade around its own interests. The consequence, whether deliberate or not, was that the colonies lost the ability to self-select trades that developed their peoples. 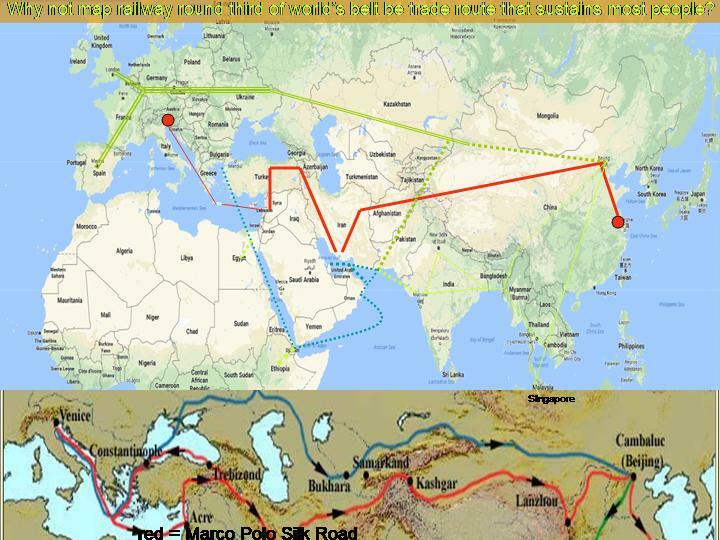 In other words trade became win-lose where once across the silk road it mainly been win-win. 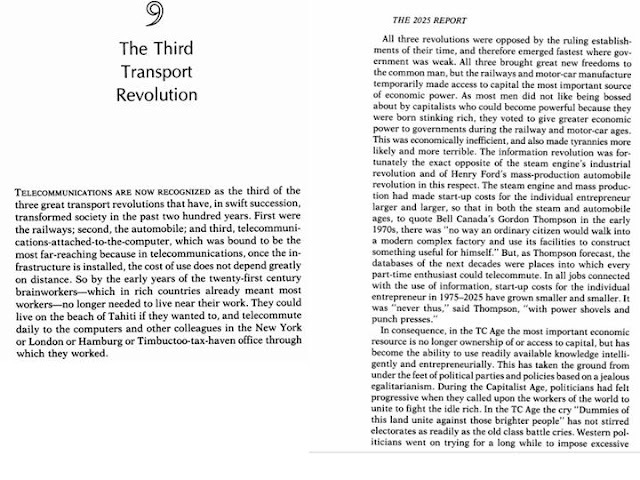 And the infrastructure empires built was often only for their controlling needs not the native peoples mobility. the pursuit by big nations to get bigger by extracting more carbon energy than their own country possessed either through colonisation or by going to war. notably a country like Germany which had been landlocked on its south and so not a participant in colonisation had to feed its desired to get bigger by taking the iron and coal from neighboring places needed for building ever more powerful machines. And as we humans raced towards this dead end, investing in 1000 times more human connectivity can be questioned as both a huge opportunity and a huge threat- what professional marketers used to SWOT. Strength and weaknesses openly appraise where your history/culture of human endeavor has brought you to, Opportunities and Threats map back the future shocks of whether you compound hi-trust or low-trust exchanges going forward be these with other people or nature's environment. 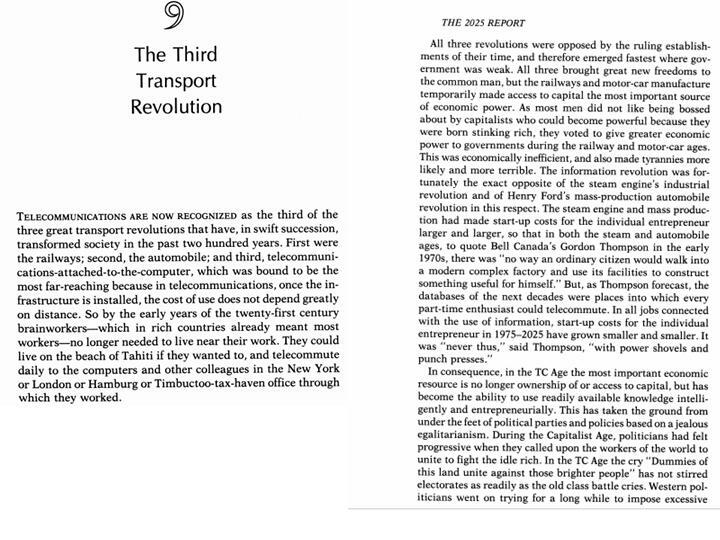 These economies that have grown developing nations since world war 2 have been designed around innovating win-win trades and increasingly harnessing this to the 1000 times more now being spent on communications/connectivity technologies (2016 versus 1946). However successes have been stalled where they have got caught up in financial bubbles mainly caused by property speculation. 2008's extreme sub-prime bubbles and frauds took on both a new scale and a dimension which for the first tome showed exponential risks to countries savings could be more global than regional or local. To world record job creatir, belt and roiad mapamkers and those who want to understand where economics is designed "inter-generationally" around trading transparency, trustflows ands winw-ns friends of valuing youth economies recommend the wporls of adam smith, JB Say, james wilson, wallter bagehot and the last chpater of keynes on the general theory of money.